As jewellery houses grapple over ways to seduce the elusive experience-seeking millennial, Gucci effortlessly breezes in with a collection that speaks straight to the heart of the future luxury consumer. The secret lies in the total immersion of all things Gucci in the fantastical world of Creative Director Alessandro Michele that is an experience in itself. His Le Marché des Merveilles is a rich, quirky and beguiling narrative that like the Pied Piper of Hamlin, draws in a fascinated crowd of followers who queue outside Gucci stores for the handbags, ready-to-wear and lately the jewellery and watches. The collection is reminiscent of bizarre yet precious treasures found at a flea market that once polished up, are worthy of a cabinet of curiosities. Photographer Julia Hetta was commissioned to create a mood to match the inspiration of the kooky Le Marché des Merveilles jewellery collection. Gucci’s lion motif adorned with diamond pavé and bright coloured gems features heavily. Far from looking newly minted, the lion’s nubby golden form and snarling gesture allude to a mysterious and mystical past. A pearl or gem sits tantalisingly between the feline’s jagged teeth or his eyes glow bright with rubies. Talisman-like necklaces on slender chains are crying out to be stacked and bangles are made to worn solo or easily mixed into an eclectic bundle. Earrings have a Victorian air that paired with a ring that links along the back of the hand to a bracelet throws the look into a stylish and exotic tail spin. The Le Marché des Merveilles jewels feature a whimsical version of the Gucci lion cast in gold with colour gemstone highlights. Bringing to life this imaginary world, Gucci commissioned photographer Julia Hetta to create a series of portraits in the style of the Flemish Renaissance. Darkly romantic and troubling, the look is as far from corporate communications campaign as jewellery has yet seen. What works for fashion and leather goods, seems to work for jewellery. Inspired by Flemish Renaissance paintings, the photographer Julia Hetta captures a dark romantic mood for Gucci’s jewellery shoot. 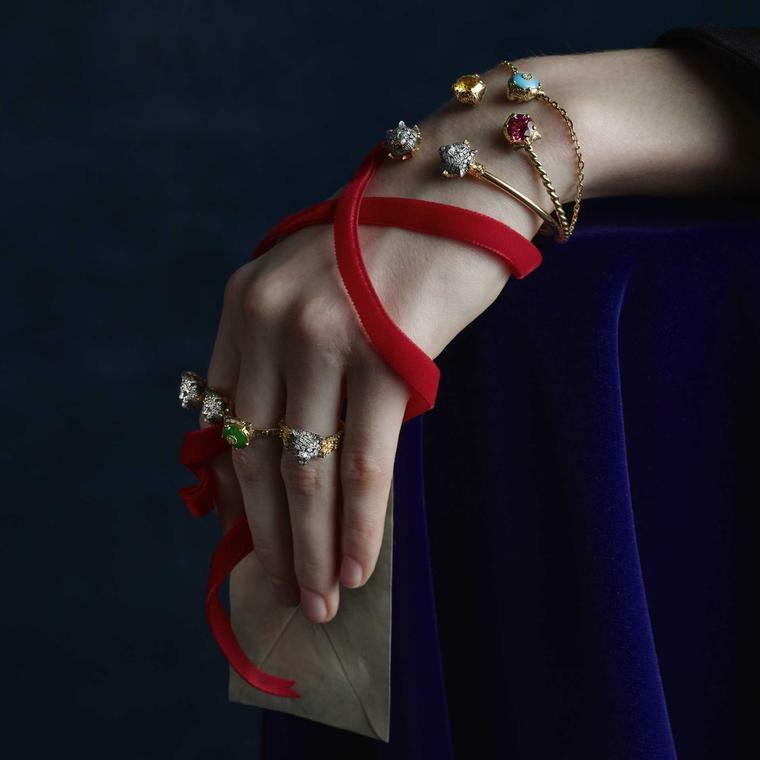 With the same magnetic appeal as the Le Marché des Merveilles ready to wear and accessories, the jewels are by Alessandro Michele, Gucci’s Design Director. Photo by Julia Hetta.